Quick question for the day: Do you have an artifact from your past lying around that explains a lot about who you are today? 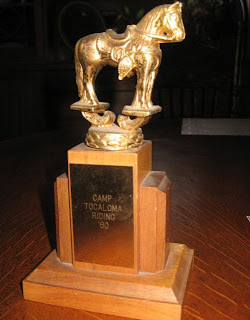 HALLIE EPHRON: My riding trophy from Camp Tocaloma in 1960. The summer started with me falling off a horse and ended with me winning the gymkhana (timed riding around barrels). Have I been on a horse since? No. They scare the bejeesus out of me. They're large. DEBORAH CROMBIE:Somewhere in a box (I think) is my first published writing, a little feature for local newspaper that I worked for briefly after college, selling ad space. I remember how thrilled I was to see my name in print. Probably a better indicator would be the fact that I still have my childhood copies of Winnie the Pooh and The House at Pooh Corner. JAN BROGAN - I think I have every single word I've ever written - from teenage dairies, to to angsty poetry, really bad short stories and college news clips. And if you've ever written anything to me, I've got that, too, and I get a kick out of rereading old letters and decades-old magazines. In general, I do not like sci-fi or anything futuristic and I am not a big fan of modern furniture. So I think all this says that I am a person who likes to hang out in the past, not the future. RHYS BOWEN: My kids have boxes and boxes of huge trophies from swim meet glories. I won the all-England dance competition once and all I got was a lousy certificate! I've kept a scrapbook of all my press cuttings since day one (but I've sort of let it go recently). My mom kept all my ballet programs and I have those. But I confess I have a display of my awards halfway down the stairs and they inspire me on days when I think I'm writing rubbish and should quit now. HANK PHILLIPPI RYAN: When my mom died, we discovered she had put together boxes of stuff she'd saved from each of us kids. I keep imagining her, doing that. Clippings from the school paper, old photos, letters to her. I had NO idea she was keeping it. Not in the box: an old postcard to her from college I'm still embarrassed about. I had illustrated it with colored pencil flowers and Judy Collins lyrics. It was so pretty and lovely and sweet and the gist of the card was that I was asking for money. Ah, college. But if the photos she saved explain how we are today, I'd say the photos show a theme of "bad hair." So reds, do you have an artifact that tells your story? Third grade report card: "William can and does interact well with the other children when he chooses to. However, other teachers and myself have noticed he is happiest when left on his own with a book to read." LOL, Ramona. I thought the same thing! My "artifact" is the big honkin' trophy I received for coming in 2nd in the state DECA Business Vocabulary competition in 1969. I can't imagine how enormous the first place trophy must have been. I had a party once, serving Mexican food, and afterward couldn't find the cap to the bottle of hot sauce. Days later I found it overturned atop the head of my trophy. Some drunk guest clearly had a bizarre sense of humor. Love the stories about Will's report card and Business Vocabulary competition!! Karen, what grade were you in and what is business vocabulary?? Lucy, I was a senior in high school. DECA is Distributive Education something or other, a co-op course of study for high school students that prepares them for jobs in marketing and retail and other business pursuits. It was in its infancy back then, but now it has expanded internationally. Business vocabulary is what it sounds like: special words that pertain to business, like markup, margins, inventory, etc. You should see the picture of me and the other first- and third-place winners. It's hilarious. The clothes! The hairdos! And I thought I was so cool, getting to wear something other than my Catholic school uniform for a change. Yikes. Lucy, I wonder what my excuse is since I don't have any recollection of writing "We love to work. Work is fun." over and over again. I have years of journals, a whole bookcase of them going back to the beginning of my first marriage. I kept them since I started high school, but had none of the high school ones since I'd moved so much and been kicked out, etc. Nothing much from my elementary or high-school days survived in my life. Until I found my Aunt Joan again (when a middle-aged adult) a few years before she died. She had saved my lock-and-key diary from when I was thirteen. Lots of boy talk, of course. I was a freshman in high school, and boys became vital then. But even more pages about books I read, story ideas, poems, and how much I wanted to write books like the ones I loved. I didn't go to Catholic school, but in junior high we had to copy "paragraphs" if we misbehaved. (Infractions like putting the lead sinkers we were supposed to be using for experiments into the teacher's coffee mug...ahem...or so I'm told...) It took two and a half pages to write out by hand and started with, "This is a totally wasteful experience" and went on to talk about how much paper, trees, and time you were wasting because you were such a rotten kid (ahem...or so I'm told...). My artifact is a photo of me in a duck suit. I was the mascot for our town's "Duck Race" fundraiser and I tripped over a roll of carpet while doing an appearance. (There were teeny holes for the eyes! And duck feet, for crying out loud!) So I'm all sprawled out, but still trying to make it look like I planned it...it seems to have been metaphorical for the rest of my life! Ha! My artifacts are all hair photos--the 45 degree angle bangs, the afro, the bad perm # 1, the bad perm # 2, etc. Explains my hair angst today. Paulabuck--DUCK FEET!! Oh, just like Scout in her ham suit. Jan - I'm with you (again!). I enjoy hanging out in the past. When my parents retired and made their move from Maryland they loaded a couple boxes of my stuff my mom had saved into the backseat of the car. She couldn't bring herself to throw away some of these "treasures," and now I can't either. sigh. I am my Mother. One thing I have sitting on a shelf is something Donald would very much like to see just disappear. It's the ugliest green dragon with the goofiest face on God's green earth. It's a music box. Does it play "Puff the Magic Dragon?" noooooo - it plays "Playmate, Come Out and Play With Me." Remember that little song?! It was one the three of us would sing during car trips. My dad happened onto this sad little dragon when I was in my 30s and couldn't resist buying it for me. My mom said he was so over the moon about finding a music box that played "Playmate," she couldn't bring herself to tell him how ugly it was. It's one of my most loved possessions. I still have my "Read to the Moon" certificate from first grade: I read 210 books that year and was the first of my classmates to reach the moon. The certificate says so much about me I used it as my profile photo on my short-lived blog. I'm a 12-year, Catholic-school survivor and I have to agree with the others that Roberta's writing exercise sure sounds like a detention exercise. Paula and Darlene--humiliation is one of our historical themes!! Kaye, don't know that song, but I can totally see why you had to keep the dragon! your dad sounds soooo sweet. And Tricia--love the profile picture! Hmmm, could I have repressed the memory of my detention????? I don't think I have anything like that - probably due to the big huck out before we changed continents but I'm careful to gather together my children's efforts every year [and try to put dates on the back] so now the attic is officially full - bit of a fire hazard really. When I was 12 years old, I entered a science-fiction writing contest. I was one of the winners and I still have my prize, a crystal beaded bracelet. I wish I knew what happened to the story! I also have the first book of poetry I ever owned, which I received as a gift when I was in second grade. It is falling apart, younger siblings use it as a coloring book, but I will never give it up. In the index, I underlined the titles of all my favorite poems. A month or so before I received the book from my parents, my second grade teacher gave us an assignment to write a poem, and I threw myself into it. I think my parents gave me that book as encouragement to continue writing poetry,which I did only occasionally over the years. I am sorry I haven't kept up with it. Younger siblings USED it as a coloring book...wouldn't want anyone to think the 56 year old baby of the family still does that sort of thing!! Deb, never too late to start writing poetry! I have models of the Mercury and Gemini space capsules, given to me as awards in the McDonnell Aircraft sponsored Junior Achievement groups. They are also mementos of my dad's work on both, along with a scorched fragment of heat shield from Mercury. Special memories. Dad told me that I'd need to work hard for scholarships if I wanted to be a teacher . . . this was in kindergarten when I came home saying "That's what I want to do when I grow up!" I love music boxes, even ugly ones. My mother left me some really ugly costume jewelry that I won' wear, but I still love to go threw it and remember how she wore those big geometric bracelets in the sixties and seventies. Scorched fragment form a heat shield from Mercury. I'd like to know about your dad's work. It sounds pretty cool. Linda, I'm envious of your journals. I've been a sporadic journal keeper all my life, and always try to be better at it. And storytellermary, what a wonderful story! I have a book report from seventh grade that I received an A for but was marked down to a C by my English teacher, Anthony Grassia. In his comments he wrote, "Meet your deadlines!" It was two days late and marked down one full grade for each day late. I followed his advice through grad school. Debs, don't be too envious. I'm much more sporadic now. I write a journal of each book as I write it--stole that idea from Sue Grafton--and only write in my regular journals in between or when something big and personal comes along. DebRo, it is never too late to start writing poetry. You can start by just scribbling down a sentence or line that you read or hear that you like. Use one of them as your first line to start you off and trigger your own thoughts. You'll be surprised what you come up with. This tunes up your mind to start thinking of and creating lines of images or musical language. Good luck! PS I suggest writing poetry to anyone who wants to learn to write better. Even if no one else will ever read your poetry. It's like a tune-up for your creative spirit. Couldn't agree more with you Linda, to write something out of nothing is to be comfortable with the environment where you are and get inspiration, the very reason why I decided to buy some modern furniture los angeles which provide me just the right space while I do the writing.